Soteria Berne is a small therapeutic community where patients suffering from acute schizophrenic psychoses are treated by an innovative milieu-therapeutic and psychotherapeutic low-drug approach. The term "Soteria" is of Greek origin and means protection and relaxation, in the present context. It was chosen in 1971 by Loren Mosher and his collaborators in San Francisco/USA as name for a pilot project focused on a no-drug or low-drug treatment of acute schizophrenia. 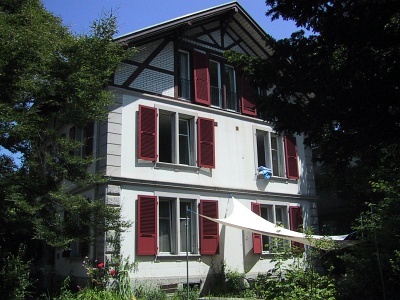 In 1984, Ciompi and his co-workers in Berne/Switzerland founded a first European Soteria house which continues to function successfully after more than 30 years. Eventually, the Soteria-idea spread out to Germany, Scandinavia and other parts of the world where it was realised under various forms. In Soteria Berne, Moshers original approach was further developed and partly modified on the basis of Ciompi's concept of affect-logic and other more recent notions, speaking for the hypothesis that critically increasing emotional tensions play a key role for the outbreak and further development of psychotic states. Therefore, to induce a sustained emotional relaxation became a main therapeutic focus. This was not primarily achieved by neuroleptic drugs, but rather by continually and emphatically "being with" the psychotic patient, in an as normal, open, family-like, protecting and relaxing setting as possible. Evaluative research has proved that objectively at least equal and subjectively partly better 2-year outcomes were achieved with much less drugs at Soteria Berne, as compared to conventional approaches. In addition, the treatment of acute schizophrenia at Soteria Berne was during the last few years constantly 10-20% cheaper than in comparable local psychiatric institutions. Costs are lowered by the fact that all housework (cooking, shopping, cleaning, gardening etc.) is part of the therapeutic program and done by the members of the therapeutic community themselves. In recent years, the Soteria-Berne concept has been completed by the development of specific methods for psychotic patients who simultaneaously depend on cannabis. 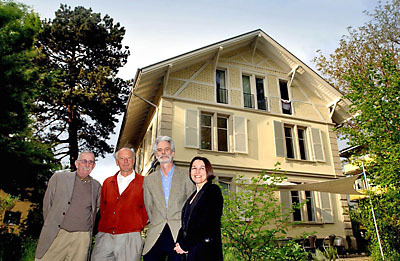 Two protected appartments and an extended ambulatory post-care service for former Soteria-patients were added, and a special service for early dectection and prevention for patients at risk for psychosis was developed, on the base of the Soteria-approach, in collaboration with the local university department of psychiatry.